~ ~ ~Jayne Stamps ~ ~ ~: Cupcake, anyone? Have you noticed that cupcakes are THE thing lately? How about trying one of these? Cute, eye-catching, and CALORIE-FREE! These are actually little boxes made with the "Perfect Setting" Bigz XL Die for the base. I have been wanting to make one of these for a long time and finally did one when Donna M. was here last week. After making one, I want to make more but I'll probably change them up somewhat. I think my next one will be made out of coordinating colored cardstock. 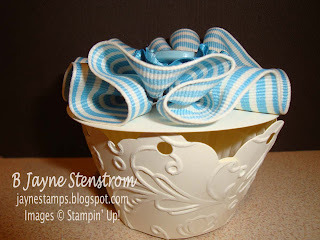 I used Very Vanilla cardstock for this one and the 1-1/4" Striped Grosgrain Ribbon in Marina Mist for the biggest "flower", the 5/8" Satin Ribbon in Marina Mist for the inside "flower", and then coordinating Designer Buttons. That's one of the things that I love about Stampin' Up! 's products - they make them so everything coordinates. 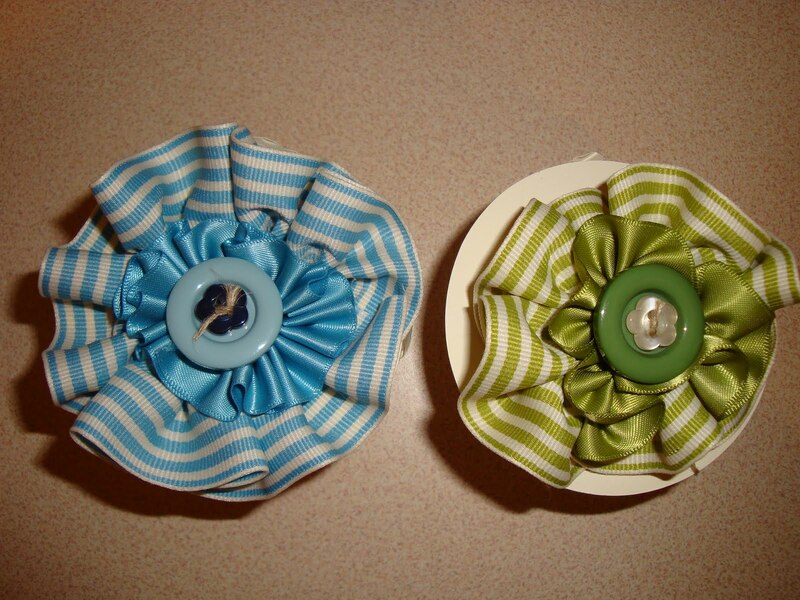 I know that my Marina Mist ribbons are going to coordinate with each other, and they will coordinate with the buttons I have, and if I use the cardstock, that will also coordinate! No worries about the colors looking funny together with our products! 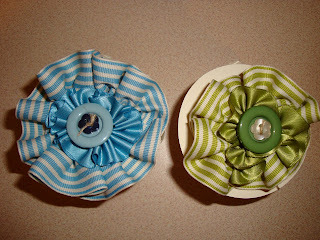 Donna made hers with the same ribbon in Old Olive. As you can see, hers looks a little different because she made her flower on top a little smaller. That's the beauty of this project - every one looks a little different and unique, but they're all adorable! Here's a little more of a side view. After cutting out the Perfect Setting die, we used the Elegant Lines Textured Impressions Embossing Folder to give it some depth and dimension. I'd like to try it with the Elegant Bouquet embossing folder. So many options to try! 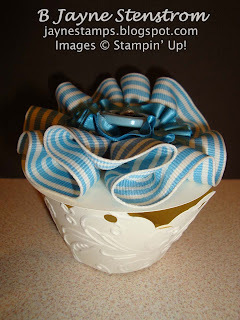 This would make such an adorable little box to give a gift to someone. You could fit chocolates inside, small jewelry, charms, cash -- there are lots of possibilities! And remember - no calories with these cupcakes!